Friday’s Foto Fun – Spooky! Oh me….what a laugh! My dates for the Howl-o-weenie Ball from year’s back. Kyla and Kaci! What a lucky guy. And what a fun foto for today! One week from today. Howllllllllllllllllllls! Speaking of fun events, don’t forget about Kyla’s Highland Games. You know you want to be in the parade! 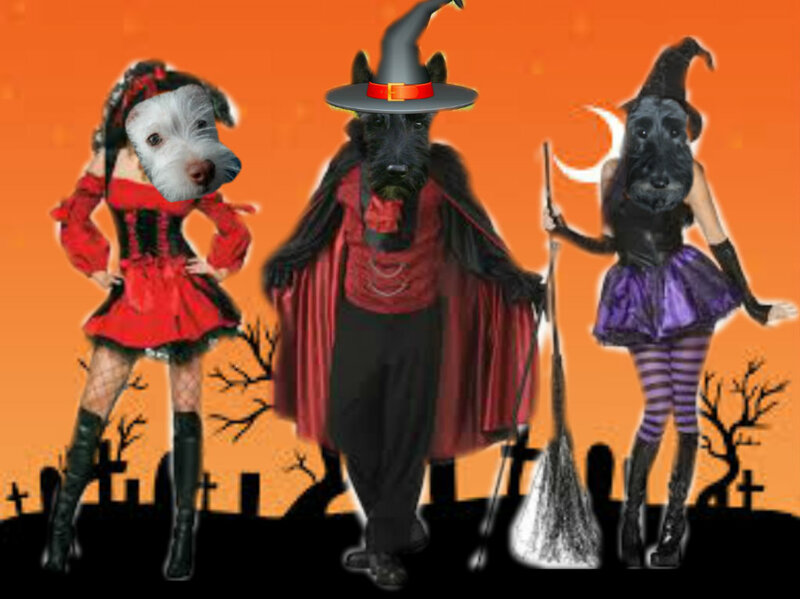 This entry was posted in Scotties, Scottish Terriers, The Scottie Chronicles and tagged dogs, funny pictures, halloween. Bookmark the permalink. 7 Responses to Friday’s Foto Fun – Spooky! Looks like you had your paws full! Howlie Howlie Ha! My goodness but you were certainly surrounded by female pulchritude last Howl-o-ween my friend! That reminds me of the ad where the guy was asked by his wife while hooked up to a lie detector, “Do you think my sister is prettier than me?”. Kyla, don’t ask the question if you’re not going to be able to stand the answer.